The Ferrara-born Luzzasco Luzzaschi might not exactly be a household name, but his contribution to the development of the madrigal places him within that elite category of composers who helped shape the course of music history. 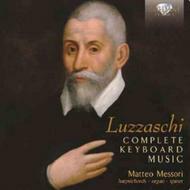 The favourite musician of Duke Alfonso II, the last of the legitimate d�'Este (the most intellectual and cultivated dynasty of Renaissance Italy), it was Luzzaschi who, in his role as the finest keyboard player of the period, cultivated the open score approach to performance. This was essentially a sort of motet or madrigal without words that focused on highly refined counterpoint and on the complexity of fugues ie four-voice writing, without recourse to embellishment or any added prettiness. Only the second of the composer�'s three books of ricercari, as detailed in this recording, has survived - a regrettable fact, given that the 1578 manuscript is unrivalled in its complexity among keyboard music of the second half of the 16th century. The book also comprises the only known free-form composition by Luzzaschi, the melancholic Toccata del quarto tuono. Also included on the recording are two counterpoints on the plainchants �'La Spagna�' and Ave Maris stella, as well as the simple, unpretentious Canzona - Matteo Messori�'s keyboard arrangement of an ensemble piece published in the Raveri collection of Canzoni per sonare con ogni sorte di stromenti (1608) by various composers. Indeed, Messori�'s interest in and understanding of this period of music history is confirmed by his critical open score edition used for the recording, as well as his assured performances. Using different Italian harpsichords to convey a sense of �'chamber music�', in addition to the organ and spinet, he conjures up the refinement and splendour of the Ferrarese court with ease and grace, presenting a strong case for why this Renaissance composer - and former teacher of Frescobaldi, who further cultivated keyboard open-score notation - deserves to be better-known.